Ask any gallery director, private or public, what “job one” is and they are likely to tell you it’s organizing exhibitions that meet their mission and satisfy the needs of their artists and patrons. As axiomatic as it may seem, it’s not as simple as it sounds. A museum or art center must build and draw upon its reputation to bring significant national and international exhibits to its audience. It must also build and draw upon ample budgets to satisfy those ambitions. Private galleries can rely on their stable of artists, connections and influence within their community to show and sell art to beginning and experienced collectors. But gallery owners must use strong marketing skills and be wary of artist overexposure to an audience gone weary of the face and brand. It would then seem easier for alternative venues like the Bemis Underground to fill its schedule and considerable space since its commitment to experimentation on behalf of emerging and mid-career artists would guarantee a ready regional supply. But those enigmatic “e” words pose challenges of their own. Since its opening in 2005 the Underground has learned a lot about finding, scheduling, curating and generally coping with emerging artists and its audience’s taste for edgier, experimental art. The Underground’s latest effort on behalf of all the above is Bemis’ first Regional Juried Exhibition, which opens officially this Friday, March 25 at 6 p.m. and continues through April 16. The exhibit, organized by Underground curator Joel Damon, features 36 finalists who range in age from 22 to 88, and over 50 works of their art. The finalists, chosen from a field of 217 by juror Kate Hackman, associate director of Charlotte Street Foundation in Kansas City, vary from familiar established artists like Gary Day, Tim Guthrie and Ann Gradwohl, to mid-career Michael Burton and Peter Cales, to emerging artists Matt Carlson, Laura Mohr and Derek Pressnall and UNL/UNO BFA or MFA candidates Jason Young, Jessica Machacek and Drew Leuders, and commercial photographer/designer Jodi Cramer, among many others. The mediums represented are just as varied, from the new media of Angeles Cossio and Trudie Teijink to the more traditional sculpture of Lauren Mabry, Peter Cales and Ryan Fisher; the mixed media of Megan Sanders, Audrey Stommes and Arjan Zazueta; paintings by Will Anderson, Neil Griess, Alexandra Borovski and Nikolaus Hansl; and printmaking from Brittan Rosendahl, Ella Weber and Jeffrey Thompson. Three of these exhibiting artists will be awarded $500 and a 2012 solo exhibit in the Underground. Hackman will announce the winners at Friday’s reception. She will conduct a gallery talk this Saturday, March 26 at 12 noon. Underground curator Damon says Bemis will profit as well. “By awarding the top three a show, it provides part of our schedule,” he said. “The true intent of this show is to put us in contact with a larger pool of area artists and put them into our sightline, especially those we haven’t been aware of.” Damon credits the recent Science Fair, a DIY effort organized by Josh Powell and Kevin Rooney to recognize alternative, pre-emerging and relatively unknown artists, as inspiration for the Undergrounds’ continuing desire to offer that next possible stage in their development. He also feels a judge unfamiliar with an area brand or name best creates a level playing field. “An outside juror gives credibility by taking the judgment out of our hands,” he said. “She’s not familiar with the Underground scene. Her lack of bias helps us offer them something more than a coffee house or bookstore to show in.” That explains why Bemis veterans like Day, Guthrie and Carlson are showing alongside the relatively unknown and fresh performance art of Cossio, the installation of Teijink and an inkjet print of Thompson which first greet the viewer and set an exemplary stage for what is to follow. It’s not an overstatement to say that virtually all of the finalists are worthy of an Underground show, a conclusion shared by Hackman. who says, “I was pleased to find many artists with very strong bodies of work, all of which I would have happily included. And there were many strong additional artists that there simply was not room to include.” As for her selection, Hackman said that though she used no hard and fast criteria, she was “looking for work that felt fresh, relevant and representative of a specific and distinctive point of view. I was favorable toward those who seemed to be taking risks in their work. “There are definitely some artists I found through this process that I will invite to submit proposals for shows in Kansas City, so hopefully that is of value, perhaps especially to younger artists who are in the fairly early stages of building their careers.” The work in this exhibit is that good. But while any one of the more established artists may indeed win this competition, this review is mostly interested in work from artists newer to this community. What follows are a dozen artists who caught this critical eye and his personal choice for a top three award, though all are deserving. — The digital prints of Sean P. Morrissey. Featuring 3-D geometric forms in a 2-D space, the impact of these oddly titled pieces (All Things Are Tragic) is oddly disorienting: a genuine paradox of emotional detachment and visual engagement. — Another digital print, “An Age of Comfort and Refugees,” this one from Alison VanVolkenburgh. Using a striking one point parallel perspective, this socio-political piece separates two sets of silhouettes, one black, one white like sheep and their shepherds on a runway to an unknown future. — An ongoing installation, Imminent Danger, of even greater socio-political portent by Ann Gradwohl that will remind some of Guthrie’s Underground installation, Extraordinary Rendition, what with its array of surveillance cameras and monitors and its own provocative American flag with green stripes and red stars. Sit down and watch yourself watching yourself for your daily dose of paranoia. — A conceptual mixed media collage, An Underlying Sadness, from Emma Nishimura, that features two empty, billowing shirts linked together on a mountainous background. Though it eludes interpretation, its dingy black and gray palette and somber mood suggest possible environmental and human catastrophes and their aftermath. — The two paper collages, Revelations and Afterlife Abstractions from Derek Pressnall, with their densely overlapping imagery that references similar work from Josh Powell and Nic Bohac, minus the social commentary. Instead, Pressnall’s images and iconography are more mythical and spiritual. — The 88-year-old Nikolaus Hansl offers, ironically, naïve acrylic paintings, e.g., “Halloween,” whose scenarios of a simpler way of life shows he hasn’t lost his imagination and innocence as the puppet master of his puppet-like figures. — Two untitled digital photographic prints of William Hess from his Vessels series that are virtual, contradictory companion pieces of death and repose. The first is a semi truck on its side, detached, lifeless and abstract, and the second is grandpa, laid out in a funeral parlor, solemn, “gazing” upward and surrounded by a heavenly, albeit artificial light. — A relentless video loop from Kan Seidel whose message from its black Woman, “I am a black woman, the American dream, the American destiny…for every white woman” speaks dramatically for itself. — While the above commentary on gender and race was man- made, conversely, the three provocative, black and white digital prints that deal with passive-aggressive issues of identity and roles in the bedroom come from an anonymous woman known only by her titled pseudonym, Z Xonk. A trio of possible winners from the 36 finalists in no particular order might include: — The three whimsical, imaginative animated and painted videos of Michael Burton, whose collaboration with wife Anne in Tween is currently on display at the Fred Simon Gallery. Here Burton makes good use also of his classical soundtrack and sound effects to create a moving, humorous and sensual experience in broad cinematic strokes. 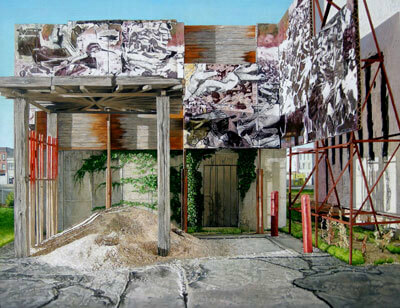 — Conversely, Neil Griess, the nephew of artist Kent Bellows, offers two pleasing oils in a similar Photo-Realism style as his uncle, but have an interesting surrealism of their own due in large part to his detached POV as if creating/seeing these fabricated cityscapes through a telephoto lens. — Meghan Sullivan’s marvelous painted sculpture, “Awkward Conversation,” that isolates one female from two others and their male centerpiece. Though the figures are primitive their body language and posture gives clues to what it’s like to be an outsider in this “Big Love” scenario, but just as awkward is the sculpture’s placement that discourages viewers from circling behind and seeing this social drama reinforced, arm-in-arm.